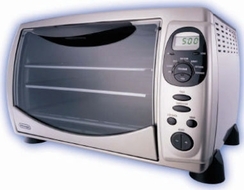 UNIQUE "HEAT CIRC" TECHNOLOGY along with dual heating elements enable the twice-heated air to be displaced over the food more evenly and more directly, which can reduce cooking time up to 20-50%. PATENTED DURASTONE ENAMEL INTERIOR is easy to clean and distributes the heater faster and more evenly, producing the best cooking results. DIGITAL CONTROLS WITH LCD DISPLAY make cooking simple and fast. 8 POSSIBLE COOKING FUNCTIONS including bake, bake with convection, broil, keep warm, defrost, rotisserie, pizza function and dehydrate make this the ideal multi-function oven. ROTISSERIE SPIT (with 12.5" of usable length) is easy to detach, load and clean. It is used in conjunction with bake pan for convenient cleaning. EXCLUSIVE PIZZA FUNCTION is specifically programmed to control the entire cooking process to make crispy 12" pizza (even from frozen!) with the simple push of a button. INCLUDES PIZZA TRAY ACCESSORY! DROP DOWN TOP HEATING ELEMENT allows you to easily clean the top of the oven. INTERIOR LIGHT allows you to safely view and monitor food. TWO-TIER COOKING CAPABILITY allows you to cook two different dishes simultaneously without sacrificing performance. OTHER ACCESSORIES INCLUDED: 2 cooking racks, 2 low-profile DuraStone enamel bake pans, rotisserie kit, DuraStone enamel rotisserie pan. Internal Capacity: 1.1 cub. ft.